Google is making its Gmail web mail service safer by including information such as last log in, activity and ip address that it was accessed from to the page's footer. The Gmail service (or Googlemail if you are reading this in Germany) is one of the most popular web mail services, but Google is keen to make it safer. People can now see if they are still logged in on another computer and check their recent activity to ensure that their account is not being accessed by anyone else. "Your email account can contain a lot of personal information, from bank alerts to love letters. Email that, I'm sure, you don't always want other people to see," Gmail Engineer Erwin D'Souza posts on the Gmail blog http://gmailblog.blogspot.com/. 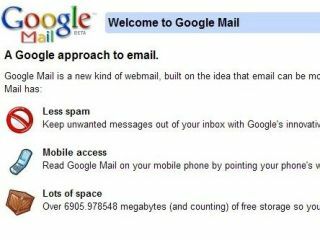 "We understand how important your Gmail accounts are to you, so we're adding a new layer of information and control. With this new feature, you can now track your recent sessions and you can also sign yourself out remotely." There is also an option to sign out of all other accounts - for those moments when you realise you left your life on display on a public computer - and a separate activity section that tracks longer term access info. It's an admirable idea from Google – and may well serve to a) protect people from identity theft or snooping parents/friends/enemies and b) show people that they are being watched very carefully on the internet at all times.